Playing and winning the ESPP game is not as simple as writing a check to the company and receiving discounted stock. To maximize ESPP benefits, the first step is to understand the timeline of important events in your ESPP game. 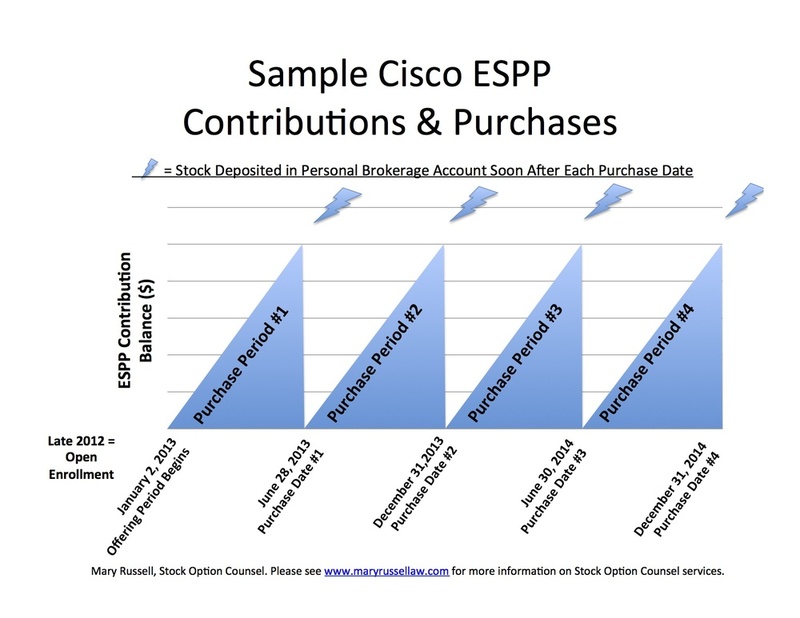 In most ESPPs, the timeline flows like this: (1) employee enrolls to participate in an Offering Period and agrees to have the company deduct a percentage of his or her income to hold for later purchase of the company’s stock; (2) payroll deductions continue throughout the Offering Period; (3) the company holds onto the employee’s payroll deduction funds until special Purchase Dates; and (4) on each Purchase Date, the employee’s accumulated funds are automatically used to purchase discounted company stock for the employee. Cisco starts two games (Offering Periods) per year. Each Offering Period lasts for two years and has four six-month rounds (Purchase Periods) within it. If a Cisco employee signs up for an Offering Period during Open Enrollment, he or she authorizes the company to take a percentage of his or her income at every pay period during the Offering Period (Contributions). Cisco holds the employee’s Contributions on his or her behalf to purchase stock at the end of each Purchase Period within the Offering Period. The dates on which the purchases are made are called Purchase Dates. Contributions accumulate during each Purchase Period. 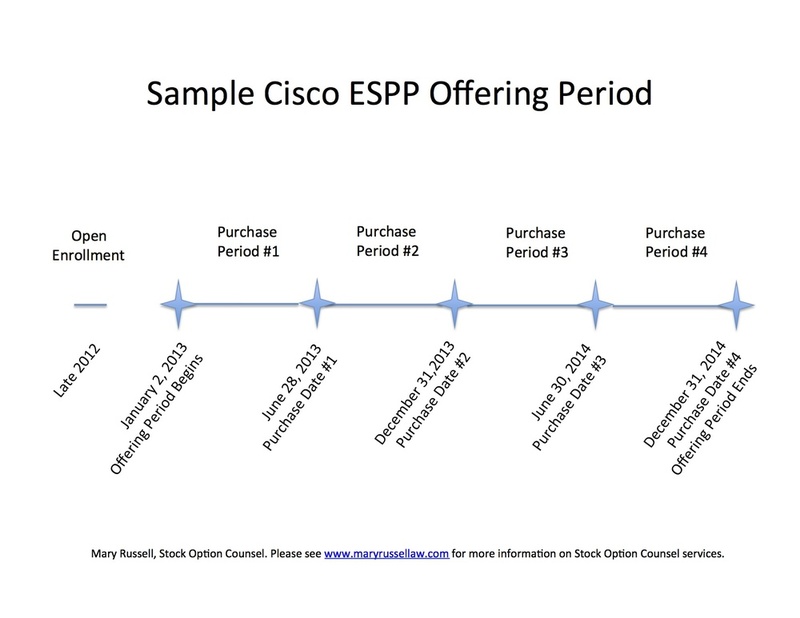 On the last day of each Purchase Period (the Purchase Dates), the employee’s Contributions are used to purchase Cisco stock at a discount. The company creates a special brokerage account for each employee and deposits the stock into that account after each Purchase Date.